Tyneside Window Cleaning Co are your expert window cleaners in the area. With the ability to get to high reach windows with ease and more importantly safely, you can rely on our team to provide professional high reach window cleaning. Using the modern technique from Thermopure, Ionic we can reach and wash at all heights to ensure a thorough clean every time. By using hot water to clean rather than cold we can make sure that all built up dirt, baked on stains and any unwanted mess is removed efficiently without the need for harsh chemicals or vigorous force. 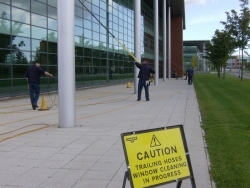 With the 60ft long extendable pole and soft bristled brushes we can carry out high reach window cleaning from a safe ground level keeping costs and time taken down. As well as extendable poles for cleaning we have reliable cherry pickers that can reach areas not accessible from land. Using our specialist equipment we follow strict health and safety procedures to ensure that our cherry pickers are safe for use at your property. As a Safe Contractor you can count on our team to deliver safe results every time with unbeatable levels of quality. Since being established in 1897 we have developed our window cleaning methods to be high quality and reliable for all of our clients in the area. Incorporating state of the art technology and dedication to detail we are able to use pure water and long reach extensions to clean your windows, roofs and various other materials. We have worked on various commercial buildings providing high reach window cleaning to anyone in the area. Our team have cleaned Beaverbrooks, Greggs, Marriott Hotels and even Galaxy Radio windows to ensure their commercial premises is clean all year round. Call 01912 529 563 to learn more about high reach window cleaning in the area. With flexible working times and contracts available you can get everything you need from skylight cleaning to generic window cleaning here with Tyneside Window Cleaning Co.